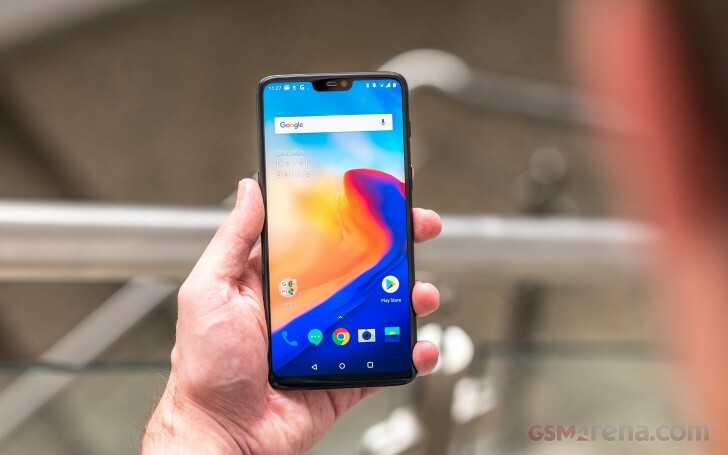 The OnePlus 6 has a 6.28-inch display of a 19:9 aspect ratio that accommodates a notch up top. The resolution is 1,080 x 2,280px and that makes for a 402ppi pixel density. It's an AMOLED panel, which OnePlus likes to call Optic to differentiate it from others on the market. Plus, you can't spell Optic without OP. In our testing, the OnePlus 6 posted a maximum brightness of 456nits, a small bump over the 5 and 5T. Just like them, there's no brightness boost when in auto mode. The Galaxy S9+ is a lot brighter with auto enabled, but is dimmer when you're moving the slider yourself. Even the far from perfect LG V30 screen can push out upwards of 600nits in auto mode. The Huawei P20 Pro's non-Optic AMOLED can also go above 600nits. The Pixel 2 XL, on the other hand, is behind the OnePlus 6 in maximum brightness and has no auto boost either. In our sunlight simulation test, the OnePlus 6 posted a lower score than the OP5T, but then the 5T has the second-best result in the modern era. Despite the drop, the OP6's contrast under direct light is still excellent, almost Galaxy S9+ excellent, and better than the likes of Huawei P20 Pro, LG V30, and Nokia 8 Sirocco. When it comes to colors, with the OP6 you can have your cake and eat it too. The Default mode (that's what it's called) has a noticeable bluish tint to the whites, plenty of punch and colors all over the place (average DeltaE of 6.3). There are also sRGB and DCI-P3 modes, however, which are both very accurate to their respective targets (average DeltaE of 2.3 and 2.1). The OnePlus 6 had loudness well above average in our external amplifier test and a flawlessly accurate output leaving us with nothing much to comment here. Plugging in a pair of headphones did a moderate amount of damage to the stereo crosstalk and degraded the volume to average. It's still a respectable performance though and one that will leave few people disappointed. The OnePlus 6 uses the same capacity battery as the two 5s before it - 3,300mAh. The display grew a little from the 5 to the 5T, and now there's an extra few pixels to light up so it's no wonder that we're seeing a downward trend in battery life. In our testing, we measured fourteen and a half hours of looping videos offline - an excellent result on its own, yet about two and a half hours short of the 5T's number, itself down about two hours from what the OnePlus 5 posted. Similarly, in our Wi-Fi web browsing test, we recorded 9:19h for the OP6, 10:09h for the OP5T, and 10:54h for the OP5. And then comes the reverse trend in voice calls, where the OP6 calls it quits after about 28 hours of yada-yada vs. the 22:28h of the OP5T and 19:27 of the OP5. Overall, the OnePlus 6 scored a 76h Endurance rating in our four-pronged test (a reminder that we also measure standby, that's not featured on the scorecard). Our endurance rating denotes how long a single battery charge will last you if you use the OnePlus 6 for an hour each of telephony, web browsing, and video playback daily. We've established this usage pattern so our battery results are comparable across devices in the most common day-to-day tasks. The battery testing procedure is described in detail in case you're interested in the nitty-gritties. You can also check out our complete battery test table, where you can see how all of the smartphones we've tested will compare under your own typical use. OnePlus' Dash charge tech is really life-altering, and we've heard of folks who have entirely abandoned overnight charging once they got their OPs. It's understandable - a full charge from flat takes 1:15h on the OnePlus 6, while 30 minutes into it, a flat battery is already at 60%. The one downside is that Dash uses a proprietary cable and charger and you need both of these for it to work. 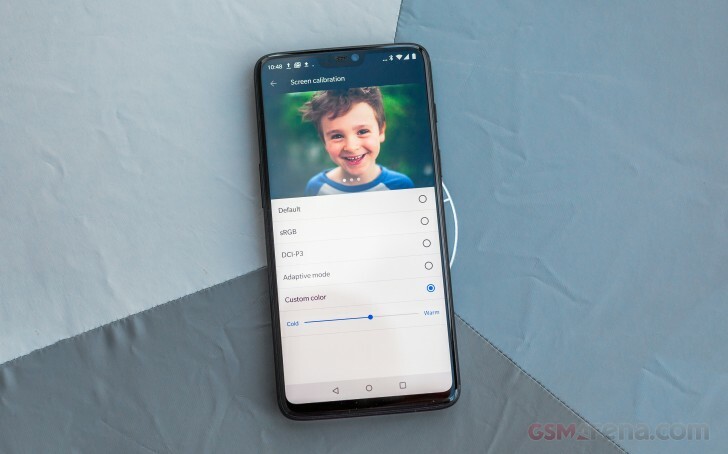 The OnePlus 6 has a single loudspeaker, a down-firing one. It's not very loud either, though it does fall in the 'Good' category, as our testing methodology goes - it's just we've been spoiled recently by mostly 'Excellent' loudness. The OnePlus 6 is a little boomier than most when it comes to the low end of the spectrum, which is nice.